Heres another one of those amazing homes as a real estate agent that I have the awesome opportunity of selling where the owners have so meticulously renovated & maintained this home over the years. From the interior to the exterior, this home is MOVE-IN READY & homeowners have spared no expense in maintaining its integrity & beauty.Custom-built in 1992 this home consists of 3BR/2BA, attached two-car garage, covered/screened lanai, & oversized half-acre lot. 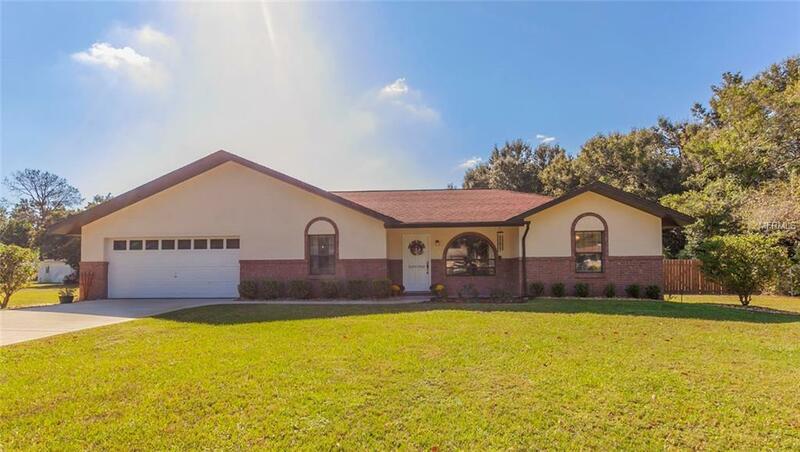 Situated in the "family friendly neighborhood of Lake Miona Heights this home is centrally located to The Villages, Schools, & Shopping and comes with NO BOND, NO DEED RESTRICTIONS, OR HOA. Totaling over 2,000 sqft (garage & lanai included), this home is very quaint & offers a split floor plan w/ textured knock down ceiling/walls & wood/tile/carpet floors throughout. Recent updates include new central heat & air, both Master and Guest bathrooms remodeled, fresh paint on the interior & exterior of home & much more. The Kitchen is gorgeous w/ hardwood floors, granite countertops w/ backsplash, accent overhead lighting, & stainless steel appliances. The dinette located directly off the Kitchen is ample in size & has a beautiful bay window overlooking the privately fenced backyard. The Living Room has tile floors & is centrally located in the home w/ French Doors leading to the covered/screened lanai. The Master Suite has beautiful hand scraped hardwood floors, walk-in closet & en-suite! Call or email me today to set up your private showing.